Rather than old Saint Nick or a couple of reindeer, [Tyler] decided to top the roof of his home with a disturbingly well done rendition of everyone’s favorite��Austro-Bavarian goat-demon, Krampus. While he did finish the build off with a store-bought Krampus mask, every other component was made with about a 60/40 ratio of hardware to craft store scores. While your holiday decorations this year may not include any spawns of hell, the general construction techniques and resourcefulness [Tyler] shows in this build may come in handy when Halloween rolls around again. The “skeleton” of Krampus is made up of PVC pipes and fittings mounted on an MDF base. Not only do the PVC fittings make it easy to recreate the rough anatomy of a humanoid figure, but if you don’t glue them all together, you can take it apart later for storage. We might have gone with something a little heartier than MDF for the base, but at least [Tyler] added a few pieces of galvanized pipe at the bottom to give it a little weight down low. 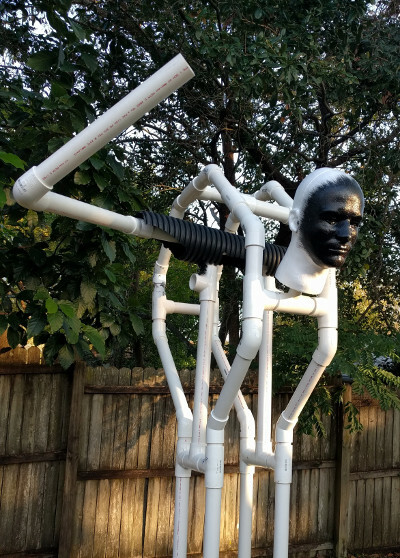 Things start to get interesting when [Tyler] adds sections of drainage pipe to his PVC skeleton to give it a more girth, as he was finding the bare PVC didn’t have a realistic presence when the robes were thrown over them. [Tyler] also uses expanding spray foam to soften up areas such as the hunched back, which may look messy but has the dual advantages of being cheap and fast. The figure’s robes are made up of a patchwork of burlap, waterproofed with a spray on liner intended for pickup truck beds. With the application of red and black spray paint and the customary white fringe, it really nails the look. 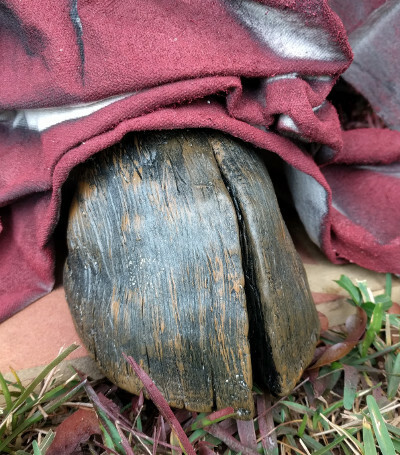 A particularly nice detail is the hoof peeking out from beneath the robes, which [Tyler] made out of painted air-dry clay. It’s an awesome detail, though almost impossible to see once Krampus is mounted on the roof. Maybe it’s just us, but we think putting so much effort into a nearly hidden feature of a project is the true mark of a master craftsman; this is a secret little hoof that [Bob Ross] himself would be proud of. While we can’t say we’ve played host to holiday scamps like Krampus or Belsnickle before, Hackaday has certainly seen its fair share of festive hacks over the years. This is AWESOME!!! I’d love to have one just like it outside of my apartment door, especially since we’re in the last apartment down a long, somewhat dark hallway. I didn’t mean to put this reply here. Sorry. There is no way for me to delete it? This could be bad for “hackers” if the creator of the non-existent war on Xmas, the pervert (all edged) Bill O’Reilly happens to see this. More fodder for his tirade, Billy isn’t likely to looking for a gentler and kinder definition. hacker. Anyway I like it. Something I’d try to duplicate if I was into elaborate holiday decorating. To that point I understand this is seasonal decoration, not necessarily Xmas decoration. Unlikely because Krampus is part of the original Christmas but was omitted by the corporations. Don’t worry about idiots on the internet because there will always be idiots on the internet. Wow, just wow. I love it. Great work. Someone’s been a good little boy. Good Lord, look at that tongue. I never thought Krampus was such a thing more than 100km away from the Austrian border (although Krampusläufen are plenty of fun). Is it popular somewhere else? We have many germanic immigrants here in the US, some of us first gen americans got to hear scary stories about krampus and babajaga. This looks really great, I like how he went through so much work to make (almost) all the parts. I don’t think this post mentioned it, but even the hands/fingers were made from scratch. Seems like only the face used a commercially available part, but can hardly blame him there. Why try to make that from scratch when such a good looking prop was already on the market.